This service is suitable for all types of flat screen TV including LED, LCD, Plasma and 3D TV's. 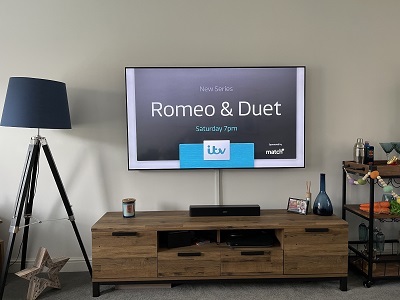 Our expert audio visual engineers will assess the installation conditions; provide any advice that you may require and wall mount your TV at the agreed position. AV Installs can wall mount any size TV to any type of wall including solid walls, cavity walls, stud walls along with dot and dab. We will supply any specialist fixings required along with a 12 month installation warranty. Included with this service is a complete cable management solution. A strip of plain white trunking will be used to contain the leads that connect the TV to the other auxiliary devises; alternatively they can be bound in black spiral cable loop. The trunking allows access providing more scope should customers wish to add more cables and devises looking ahead to the future. Next all the auxiliary equipment is connected to the TV and all the interconnecting leads that normally get tangled up in a mess behind your equipment will be tidied up with cable ties and spiral. After the TV is set up and calibrated with the other equipment our engineer will provide a demonstration of all the equipment and will be more than happy to help with any questions that you may have operating the system. The Standard TV Wall Mounting Service is a fixed priced service, subject to a brief free of charge telephone survey, we will then email an official quotation along with terms and conditions. All standard installations come complete with a full twelve month installation warranty and AV Installs is a Northamptonshire Trading Standards Approved Buy With Confidence Member and only uses its own engineers which are CRB checked. AV Installs can also assemble any furniture that you may have purchased to house your auxiliary devices or we can also install floating AV shelves to house your equipment on. AV Installs supplies an extensive range of AV Furniture and Floating AV shelves units with cable management. TV setup, tuning and calibration. Connection of all other devices. Option to purchase leads mounts & accessories. I used AV Installs to put up my flat screen TV on the wall and would highly recommend them. AV Installs were very helpful, especially as I am not very technical, explained all the options available to me and fitted the TV within my budget. My TV was fitted with little disruption and is now a fantastic feature in my living room. Very happy with the installation provided will be recomending your services to friends and family. I am thinking about having our 40 in tv mounted on the wall but there are no power sockets close to where we would want it. Does the price include extra power socket or what would the solution be for this be? The tv would need to go above a radiator, is this also an issue?